On June 29, 2017, the OGP Steering Committee received a letter from the Government of Tanzania announcing its withdrawal from OGP effective July, 2017. The OGP Steering Committee recognizes the participation of the Municipality of Kigoma Ujiji in the OGP Local program (formerly known as OGP Subnational Pilot). As part of the program, OGP will continue to provide technical support to the Municipality and the civil society partners to achieve their local open government goals. The following text was contributed by the Government of Tanzania. 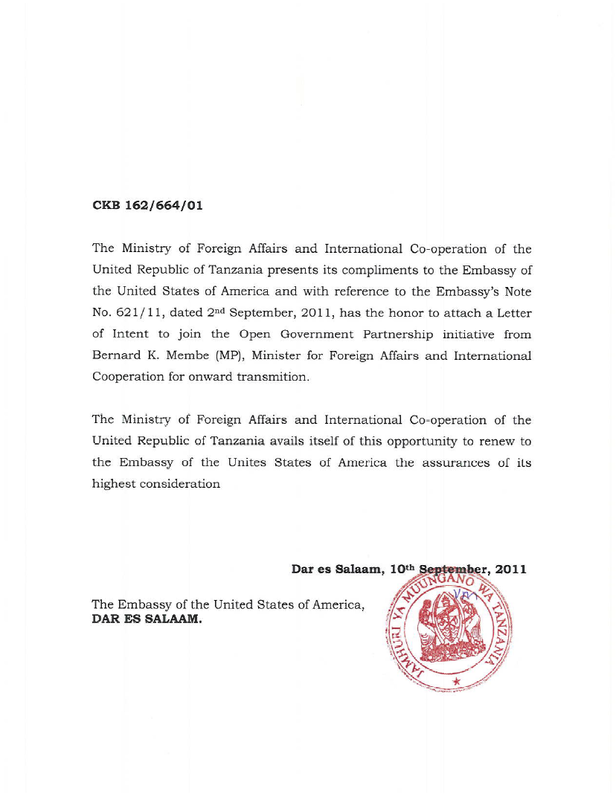 Tanzania joined the Open Government Partnership Initiative in September 2011. The intention is to make the Government business more open to its citizens hence improve public service delivery, government responsiveness, combating corruption and building greater trust. As stipulated under the Tanzania OGP Action Plan of 2012/2013, the OGP commitments are focused on the four pillars namely transparency, accountability, citizen’s participation and technology and innovation. Our main focus is in the Health, Education and Water sectors. On transparency, the commitment is to improve various government websites to enable citizens to access information freely and timely. A citizens Budget in simplified language has been produced. The aim is to make citizens aware of the national budget components. Participation of Citizens in decision making processes and policy formulation has been enhanced. A platform to provide feedback on government services through the www.wananchi.go.tz website is in place. Client Service Charters in the Education, Health and Water sectors have been updated. The National Audit Office website http://nao.go.tz has been improved and legislative amendments on asset disclosure by public leaders is in the final stage of enactment. The aim is to strengthen accountability and integrity. Furthermore, in improving transparency, citizen participation, accountability and integrity, the Government is finalizing the Water Point Mapping System for monitoring rural water supply services (https://wpm.maji.go.tz): Establishing a How Do I? Nifanyeje? Website, (http://www.egov.go.tz/howdoi) which provides information on how to acquire various public services and conducting an open data assessment to establish an Open Data website (www.data.go.tz).